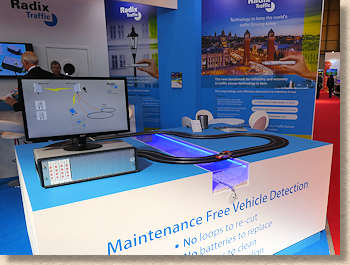 It’s a fortnight since this year’s Traffex show and it’s taken this long to produce a report because I’ve been searching for something positive to say about it. I’ve now reached the point where I either don’t bother with a report or just write up what I have, as bad as it is. The show itself isn’t completely awful: it just has virtually no relevance to the paving or roadworks trade unless you are involved in extracting money from motorists. Which is convenient as, since being sold off by Birmingham Council, the NEC has become highly adept at extracting money from motorists obliged to use its hostage car parks. It’s now 12 quid to park, and the previous concession for disabled drivers has been scrapped. And just to add insult to injury, the disabled car park has been moved *further away* from the venue entrance to make room for an almost empty VIP car park. After all, it’s so much more important that so-called VIPs don’t have to struggle to get to the main entrance, even if it does mean an extra 50 metres or more for those with mobility problems. This shows where the hedge fund owners of the NEC believe their priorities lie: rich twunts in big cars and definitely not the physically disadvantaged. Well over 90% of the hall seems to be given over to flashing lights and plasma screens. Traffic control; hidden vehicle detection gizmos; speed cameras of every imaginable type; red-light cameras; auto number plate recognition systems; debt recovery from fined motorists; legal services…. Not a lot in the way of actual construction, but plenty of technology. In fact, it is a huge struggle to find anything of interest. A few years back, this same event had a great centrepiece where construction skills were being tested live, where construction products were being demonstrated. Now, all we have are LED diversion signs and pay-by-phone parking meters. 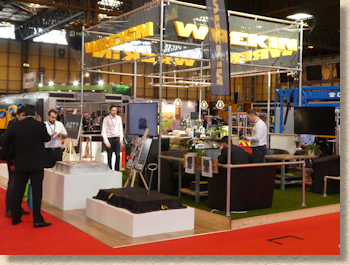 The biggest exhibitor of any interest was Instarmac with a stand of unnecessarily ridiculous proportions to show their selection of road maintenance and pavement fixing products. You couldn’t miss their display, but there was a lot of empty space and the sheer scale of it served mostly to emphasise the paucity of visitors. This must have been an enormous financial commitment by the company, but I can’t see how they could possibly recoup that outlay from this event. It wasn’t exactly packed with visitors while I was there, and very few of those visitors were bothered with construction materials – most came to see the indoor Blackpool Illuminations. 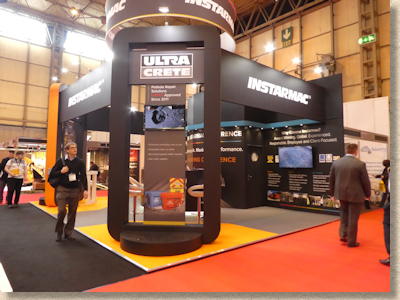 It’s not the fault of Instarmac that their stand was all-but deserted, if you don’t count the well-presented Instarmac staff. 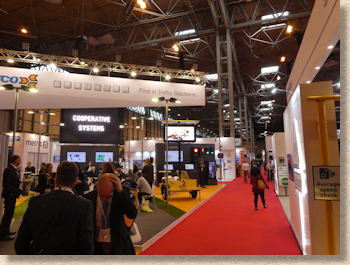 This show has evolved to a point where construction product manufacturers play a secondary, or even a tertiary role, to flashing light, cables and money-making schemes. It prompts the question about whether we will see any such manufacturers in 2019’s event. 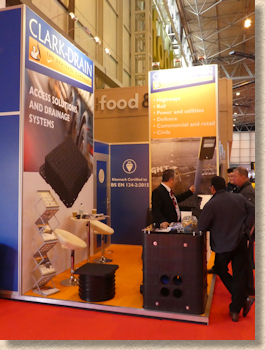 Wrekin had a medium-scale stand showing their civil engineering products, notable the ironwork such as gully gratings and manhole covers, but again, there was a sense of them being a fish out of water. Precious little interest – it seemed discourteous to break off a conversation with one of their charming staff as it might be an hour or two before anyone else stopped by. Long Rake Spar were promoting their Grantex aggregates for resin bound surfacing, but again, I sensed there was precious little interest as they lacked the disco lights or even a plasma screen that seem to be mandatory if you wanted to attract an audience at this event. Clark Drain had hedged their bets by opting for a smaller, more discreet presence against one of the walls, but managed to pack in quite a comprehensive representation of their range in a relatively small space. Manhole and Inspection Chamber covers, plenty of linear channels, access systems and more. I can’t help feeling that of all the companies mentioned so far, Clark Drain, with the lowest outlay, surely stand the best chance of at least covering their not inconsiderable costs. Two products from what might be thought of as teeny-tiny exhibitors managed to lift my spirits as I pondered the 12 quid parking charge and the 11 quid highway robbery on the M6 Toll Road. 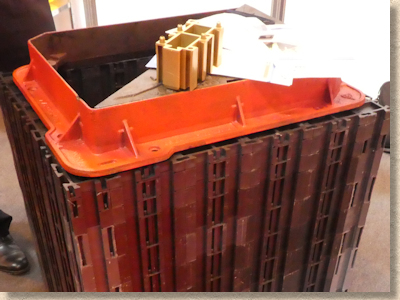 Jig-Brix is a plastic modular building system for constructing manhole chambers. Think of it as Big Lego – a series of interconnecting bricks which you link together to form rectangular chambers of a chosen size, and the availability of various ‘brick’ heights enables you to build to within 5mm of the desired height. Such a simple idea, it makes you wonder why no-one has thought of it before. The truth is, they have, and dozens of times, but this is possibly the best implementation I’ve seen in over 20 years. A single jig brix and a chamber built from them It was let down only by the salesbod’s lack of familiarity with sewer systems. The joints between adjacent “Jig-Brix”, no matter what he says, are NOT watertight and so, unless the structure is encased in concrete (or similar) to render it watertight, it should not be used for foul water sewers. Except your man was insistent that the bricks were sufficiently strong enough to negate the need for a concrete surround. He didn’t seem to understand that, to comply with Sewers for Adoption 7th ed. and/or Building Regs Part H, a chamber needs to be watertight; he seemed to regard the suggestion that a concrete jacket was necessary as an insult to his product. Having raw effluent leak out from a modular chamber which has become blocked is less than ideal. As good an idea as this may be, unless the sales team get themselves a better understanding of requirements for sewer systems, they will limit their sales to cable chambers, ground and surface water systems, and other non-critical applications. Finally, we come to what I though was the best new idea at the show. It’s one of those ideas that, unless you are intricately involved in the trade, you could easily overlook the potential for this concept. 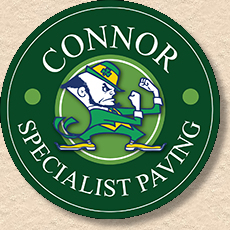 Connor Specialist Paving of Bacup in Lancashire have created what is, in effect, a cast in-situ MMA resin tactile system. So what? 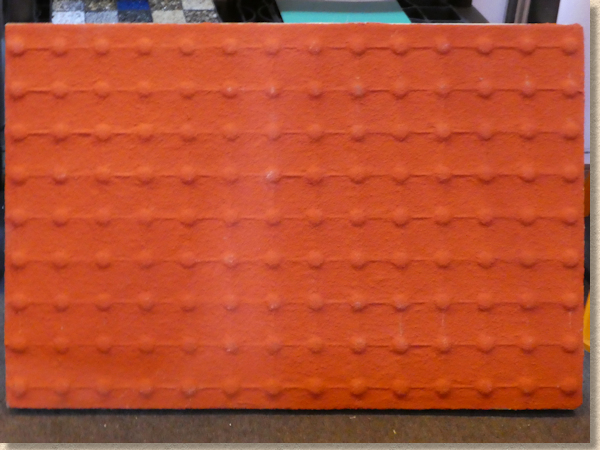 Well, this system allows tactile paving in various formats (standard blister was on show here, but Andrew Connor assured me they can do all other forms) to be fitted (or retro-fitted) to almost any pavement surface, in any length, any width and in a variety of colours. No need for pre-cast units that have to be laid a separately; no need for unreliable adhesives to glue-down flexible tiles of unknown durability. This system allows the blisters (or lozenges/cords, etc.) to be placed exactly where needed over almost any existing surface. I asked about the abrasion resistance, and was told the wear rate is so minimal it is negligible, which I found hard to accept. I’ve seem concrete tactiles wear down smooth in just three years under nothing more than foot traffic; I’ve seen steel insert blisters polish away to the core stud in less than 5 years; so being told this MMA resin is practically indestructible seems a bit too much, but, in his defence, I was directed to an existing installation at a very busy pedestrian area in NW England which has been in place for 3 years and suffered not at all, it was claimed. I shall be visiting the site in the next few weeks to see for myself, but even if there is some wear, then such a system would make re-instatement of fresh blisters a doddle, wouldn’t it? Overall, and speaking from the perspective of a paving contractor or specifier, this is a waste of time show. Unless there is a bloody impressive exhibitor list, I won’t be bothering in 2019. And if NEC persist with their exorbitant parking charges and discrimination against those of us with mobility problems, then I will have to reconsider attendance at any NEC event. Traffex 2017 - not exactly throbbing! I’m sure those involved in catching red-light transgressors and speed freaks has a great time at the show, but for the more practical minded, there really isn’t enough here to keep us entertained for more than half an hour.